In fewer than 140 characters, I had been both kind and unkind (though, I hope, in a somewhat amusing way). Within two minutes, I got a surprise. 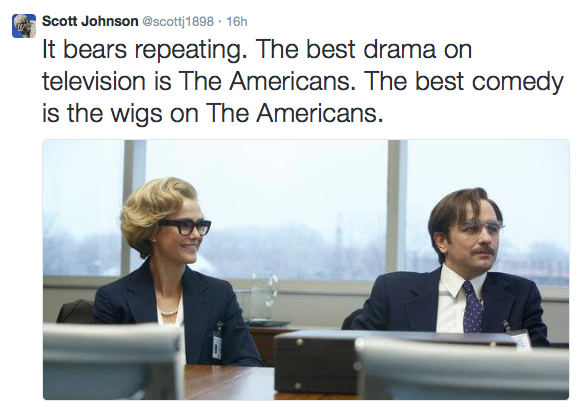 The executive producer and writer of The Americans, Joel Fields, favorited my tweet. I hasten to add that I have never met Mr. Fields. He doesn’t know who I am. In truth, I didn’t know who he was until I Googled him. If I were to try to pop into his office for a chat, his assistants would call security and have me removed from the premises. I won’t bore you with where things went from there. What’s important is that Mr. Fields broke down the normally impenetrable wall between the people who make mass entertainment and the people who watch it. He demonstrated that he has a sense of humor. Perhaps most critically of all, he more or less guaranteed that I would share the story of our interaction with hundreds of people, all of whom would wind up feeling better about him and his program. In the world of marketing, we have a word for this kind of behavior: Smart. Not enough brands do this. And by this I mean use social media to remind consumers that brands are not monoliths; they’re made up of people. Show a little humanity to your target audience. Demonstrate that the CEO not only has a pulse, but that he can take a joke and talk in something other than “corporatespeak.” Your customers will like you because of it. They might even give you the benefit of the doubt somewhere down the road when you really need it. Adweek is reporting on a study by Webtrends that shows that the performance of advertising on Facebook, which was astonishingly bad in 2009, has gotten worse in 2010. The average click-through rate has fallen from .063% to .051%. Let’s think about what that means. To get a single person to click on a Facebook ad, 2,000 people must be exposed to it. If all 500 million people on Facebook were exposed to an ad, it would net just 250,000 clicks. Put another way, if your ad were seen by a group of people the size of the combined population of the United States and Brazil, it would be clicked on by a group the size of the population of Chandler, Arizona. Webtrends’ study covered 11,000 ad campaigns and 4.5 billion impressions. All together, 4.5 billion impressions generates a total of only 2.25 million clicks. That’s not much to spread around among all the brands clamoring to advertise on Facebook. In fact, when you divide this number up among the 11,000 ad campaigns, each one averages an embarrassing 205 clicks. I don’t know of too many brands–or for that matter too many corner dry cleaners–for whom this type of performance is acceptable. Yes, yes, of course, Mark Zuckerberg and his pals will protest that click-throughs aren’t important on Facebook. They’ll tell you brands benefit from Facebook’s “social value,” not its ability to drive traffic. I give them full marks for this, if only because it must be extraordinarily difficult to say such things without giggling when they know that ad spending on Facebook is projected at $2.19 billion in 2011. Don’t misunderstand me. I’m not saying Facebook is completely without value for brands, but I am saying advertising on Facebook is damned close to it. Agencies that want to deliver value to their clients have an obligation to go beyond ads. They have to think harder and invent ways to be genuinely engaging. Forsman & Bodenfors in Gothenburg, Sweden did it brilliantly for IKEA, leveraging the basic photo tagging feature of Facebook in a way no one had ever thought of before. 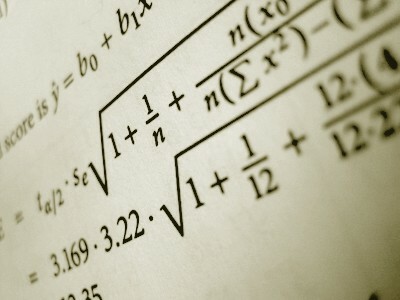 Presumably, clients who can do small amounts of math will demand comparable thinking. 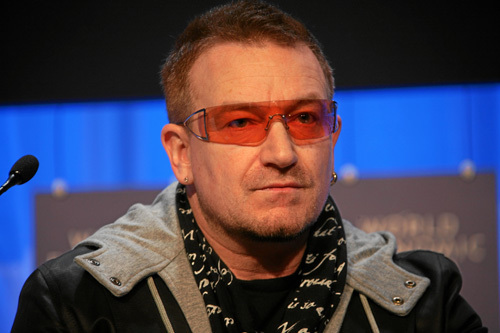 The Associated Press is reporting that as much as two-thirds of some of the grants given out by the Global Fund to Fight AIDS, Tuberculosis and Malaria–the charity supported in part by Bono’s (Product) Red initiative–is being pocketed by corrupt government officials. So bad is the situation that Sweden, one of the fund’s largest contributors, is suspending its $85 million annual contribution until the problem is addressed. The news is unsurprising to anyone who has followed the history of celebrity-backed efforts to ease the misery of Africa. We know, for instance, that the Ethiopian thug Mengistu Haile Mariam swiped millions of dollars donated by western do-gooders at Live Aid and used it to finance the army that was inflicting harm on precisely the people the charity was intended to help. Other examples are legion. This raises a moral dilemma for brands that participate in (Product) Red. Do they ignore the breathtaking corruption and accept it as the cost of doing business in Africa’s kleptocracies? Can they in good conscience urge consumers to buy products with the promise that part of the profits will go to charity without disclosing that an even larger part of the profits may go to purchasing cars, motorcycles and other playthings for dishonest bureaucrats, as it did in Djibouti (to name but one example)? There is no doubt that some people have been helped by (Product) Red. Nor is there any question that all decent men and women wish to alleviate the suffering caused by AIDS, tuberculosis and malaria. The thorny issue is this: Does the charity, by allowing billions of dollars to be stolen, actually prop up the bad governments that are largely responsible for the plight of their people in the first place? How many hospitals have not been built, how many pharmacists have no drugs to dispense because a crooked health minister wanted a Mercedes-Benz, because a dictator wanted his own Versailles? Stop saying “laundry list” in meetings if you want to avoid being strangled with a sweatshirt, towel, pillowcase or undergarment. This is not a subject on which reasonable people can disagree. What is a laundry list anyway? And who makes one? Not your dry cleaner. When you drop off your clothes, the person behind the counter writes down something like “9 shirts, 5 slacks,” which is not a list but a categorization. 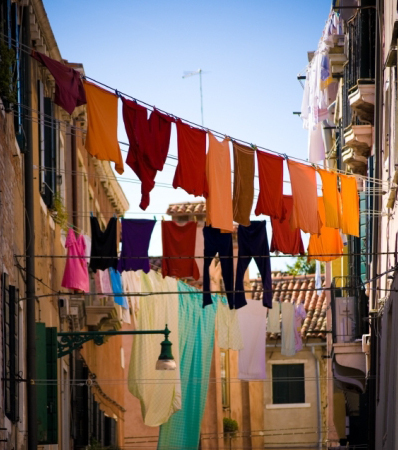 And it is not just laundry; it is also dry cleaning–so what you actually wind up with is a laundry count. Hotels don’t make (or ask for) laundry lists either. Instead, they’ll give you a form on which you can fill in the quantity of specific items for whose cleaning you wish to be shockingly overcharged. I am tempted to consign the laundry list to the realm of myth. It’s a big world, though. Perhaps somewhere a few people are squatting in front of their hampers and scribbling madly with stubby yellow pencils. Should you meet one of them, do the kind thing and recommend an appropriate medication. On the other hand, should you find yourself in the presence of someone who says “laundry list” when he means nothing more than “list,” I am reasonably certain that the ghosts of Strunk and White would not object if you chose to do him harm. With disconcerting frequency “friends” in the social media space pepper me with suggestions that I post a pre-fabricated phrase in my Facebook status update or change my profile picture to a certain image in order to show my support for some cause. Here’s the question I ask before I do so: Does this action benefit me or does it benefit the cause? In other words is the result that my other “friends” see me as caring and compassionate or does something actually happen to ameliorate a problem or injustice somewhere in the world? I suggest that almost invariably it is the former. Patrick West, author of Conspicuous Compassion, would agree. He argues quite persuasively that most of us in liberal western democracies have reached the point where appearing to care about the ills of the world has become more important than actually making a difference. The rise of social media has exacerbated this by making it possible to show that you’re on the right side of an issue by doing nothing more than moving a single finger. This is creating a generation of people who believe it is possible to change the world without effort or commitment–not an altogether salutary development. Courage and conviction are being replaced by clicking the “like” button. 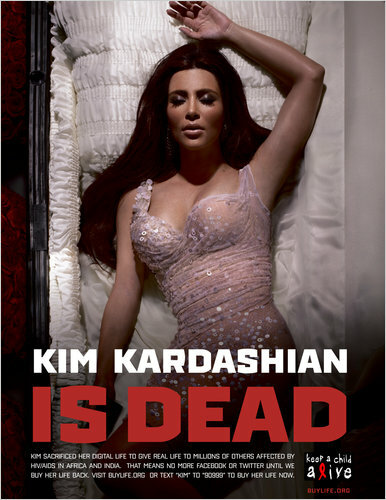 A prime example is underway as I write–the Digital Death campaign. Everyone wants to help prolong the lives of children with AIDS, of course. There can be no argument on the point. To help make it happen, Kim Kardashian and a host of other celebrities have made “commitment” to stop tweeting. Judging by the speed at which donations are coming in, no one much cares. That is to be expected. They are asking their fans to make a financial commitment in return for their doing something that is akin to giving up sugar cookies. Sorry, I’m all for fighting AIDS, but it seems to me that such a terrible disease merits a bit more elbow grease than the celebrities are offering up. So let’s bring this back around to advertising so I don’t have to change the title of the blog. Confusing commitment with a click of the “like” button afflicts brands as well. 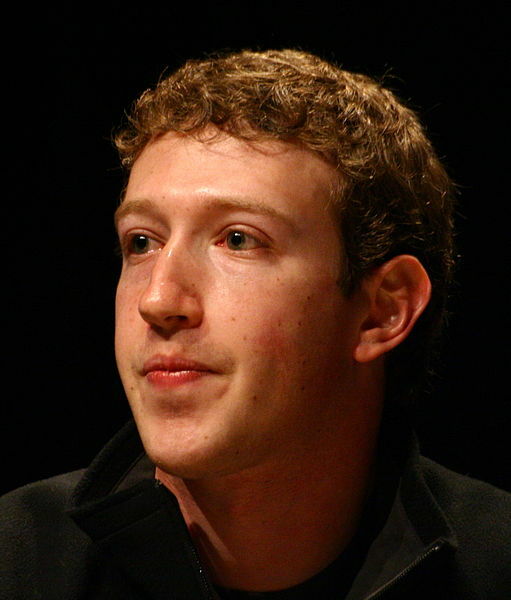 CMOs gush that two million people “like” their product on Facebook. The question that isn’t asked nearly often enough is so what? It costs people nothing to like you; they have made no commitment. You may recall that I wrote back on January 28th about the social media storm that blew up Conan O’Brien/Jay Leno imbroglio (“Team Coco–Your Outrage Cannot Be Monetized”). The point was ultimately a mathematical one. It was easy to support O’Brien on Twitter or Facebook because it took a few seconds. It was a good deal harder to commit to watching his show because it took an hour five nights a week, yet it’s precisely that kind of commitment that a successful talk show host must coax out of viewers not for weeks or months but years. O’Brien got fired because he couldn’t get real commitment from viewers, which would have resulted in a commitment from advertisers at a satisfactory price. In the face of that, clicks and tweets don’t matter. To succeed in the social media space, agencies must realize they are in the commitment business. Get all the clicks you want, but they’re not worth much until you can get the consumer to put some skin in the game. Former colleague Stephen Strong and I are co-chairmen of the committee to eradicate banner ads from the face of the earth. He recently forwarded me a couple of items that made me despise the little animated rectangles even more. 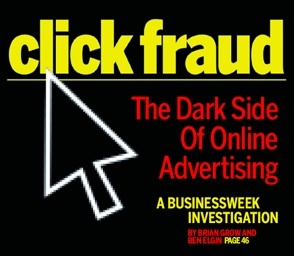 First, Online Media Daily reports that “click fraud for online advertisements rose to 22.3% in the third quarter, ending Sept. 30 — up from 14.1% during the year-ago quarter, according to a report released by Click Forensics Wednesday.” These are astonishing numbers. In what other field is this level of fraud acceptable? In the advertising industry, apparently it doesn’t matter, because agencies continue to buy billions of dollars worth of banner ads, and the number goes up every quarter. Now to the DoubleClick Report, “2009 Year-In-Review Benchmarks, which states that the overall click-through rate for image, Flash, and rich media campaigns was .10%. (By the way, static banners had slightly higher click-through rates than Flash banners.) That’s right, on average one out of every 1,000 people who see a banner ad click on it. That is, unless we factor in 22.3% click fraud, which would mean one out of every 1,223 people who see the banner would click . What’s that you say? Click-throughs aren’t important? The banner ads are making an impression on a significant percentage of the people who see them whether they click or not. Yeah, right. Consumers have become incredibly adept at not even noticing that banners are on the screen. The idea that some sort of passive branding is going on is farcical. The interactive space is about participation and engagement. To say that mere proximity to content the consumer actually wants to see is good enough is to miss the point entirely. In order for agencies to begin focusing on the type of interactive marketing that will connect with consumers–and this is essential, because whether we like it or not, we are increasingly living in a world where consumers will have to choose to see our marketing messages–banner ads must die. At best, they are a form of strip mining. Sift through a million consumers, and a few hundred will stick. The point of advertising should be to increase the effectiveness of a client’s budget through compelling communication. Except in rare instances, banner ad campaigns don’t even attempt to do this. They are an unimaginative exercise in statistical probability. And we can’t even trust the statistics because of rampant fraud. Is it possible to do a cool 30k banner ad? I suppose. Will they continue to give out awards for banner ads at Cannes? Sure (though the winners probably have massive file sizes and run only on obscure sites in Singapore, Brazil or Ninavut). Will click-through rates continue to drop and consumers get better at ignoring banner ads with every passing day? Undoubtedly. Within advertising agencies on five continents, statisticians and data jockeys have made significant progress in their attempts to swathe themselves in the garments of infallibility. Even so, anything more than a cursory glance reveals that their backsides are, just like ours, hanging out and exposed to the same vicissitudes of climate and circumstance. “When I told Jerry that eighty percent of all accidents happen within a mile of the home, he said, “that settles it, we’re moving.” – Barth Gimbel (Martin Mull) recounting a conversation with his sidekick Jerry Hubbard (Fred Willard) on Fernwood 2 Night.